One of the most important things you can do to give your dog or cat a long and healthy life is to ensure that they are vaccinated against common and serious infectious diseases. Your pets mother provides immunity from disease for the first few weeks of life via antibodies in her milk. After that period it's up to you, with the help and advice of your veterinary surgeon, to provide that protection. 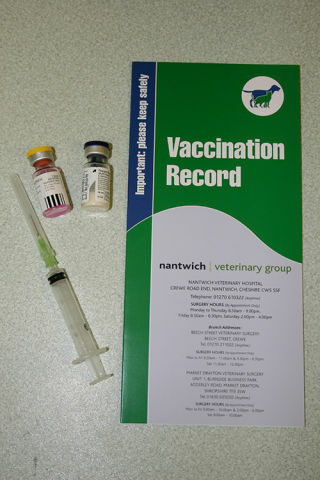 The first vaccination is usually given in two doses, the first dose at around the age of 8 weeks and the second 4 weeks later. Thereafter, your pet will require annual 'booster' vaccinations for the rest of their life to maintain protection. If there is too long an interval between vaccinations, your pet may no longer be fully protected. Your pet should be protected against those diseases which are most common, highly contagious and which cause serious illness or death. Canine diseases include Canine Parvovirus, Canine Distemper, Infectious Canine Hepatitis, Leptospirosis, Parainfluenza and Infectious Tracheobronchitis (also known as kennel cough). Feline diseases include two forms of cat flu (Feline Herpesvirus and Calicivirus), feline panleucopaenia and feline leukaemia virus.